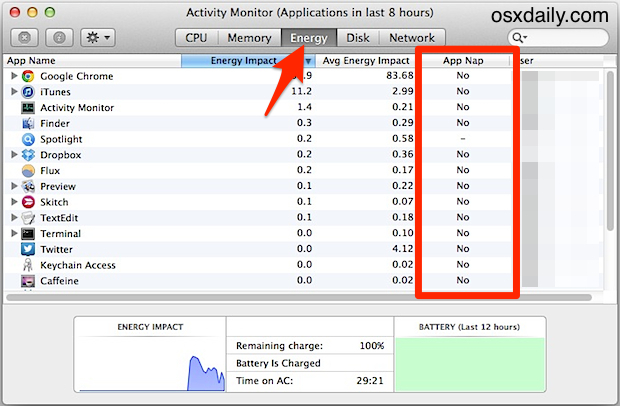 App Nap is an energy feature introduced to the Mac in OS X Mavericks that causes inactive applications to go into a paused state, helping to reduce power usage. The feature can help to prolong battery life for the MacBook line, and it can also make an impact on overall energy usage from the computer. Though App Nap has it’s perks, some advanced users may find it to be a nuisance in some situations, and thus disabling the App Nap functionality could be desirable. We’ll show you how to quickly disable the App Nap feature everywhere in OS X in one fell swoop, without having to disable it on an individual app basis. To be perfectly clear, this disables the App Nap feature entirely and system wide, meaning for every single application and process that will run on the Mac. Essentially this returns the app behavior to what it was like pre-Mavericks, where inactive idle apps do not enter into a sleeping paused state. If you’d rather just turn it off for a single app, use this instead to accomplish that. Like other defaults command strings, there is no confirmation. For changes to take effect, you must relaunch all running apps. You can do that yourself by quitting and re-opening things, or by using our DIY Quit All Apps tool crafted from Automator to make quick work of this process. Rebooting the Mac will also work fine, so if you’re overdue for a system update or restart anyway it may be a good opportunity. Once apps have been relaunched or the Mac restarted, you can confirm that App Nap is not working by backgrounding a couple of processes or hiding inactive applications for 30 minutes or so, and then checking the “Energy” panel in Activity Monitor. Look under the “App Nap” sort section and everything will be listed as “No” including the app that was backgrounded. This is really an advanced setting to toggle off and most users should leave this feature turned on, specifically because it benefits those concerned about energy usage or maintaining the longest battery life possible. Again, there’s no confirmation, but App Nap will function again as intended. This feature requires OS X 10.9 or newer to use. Heads up to a MacWorld reader for discovering the defaults command, you’ll notice it’s actually the same defaults string as that to disable App Nap for a specific app, except that “NSGlobalDomain” is used rather than an application name. Excellent find! Thanks for having the courage (some would say temerity) to point that out, as these days you risk being labeled a ‘pedant’ for doing so. My response to that charge: It matters, and it matters in a big way. If writers (and their editors) aren’t proofreading, that itself is inexcusable. If they are proofreading and seemingly-trivial mistakes like this are making it through, it’s just plain ignorance, and a sad commentary on our education system. And if you don’t think it ‘matters’, find something to do with your life other than write. All the processes on my iMac say NO in the AppNap column and I didn’t even use this trick. I have not noticed longer battery life since “App Nap” was introduced. If anything, it’s an annoying feature as it disables apps that are still processing. Both in the background and in the foreground. Quite frankly, if an app is in the background and not processing anything, it isn’t using that much power or cpu. Either way, a non-processing app or an enabled “App Nap” app is still using memory. You can’t clear the memory from an opened app or else it will crash or not work properly when you go to use it again. App Nap is a stupid feature and just needs to go away. so is it safe to do this?? AppNap! I can’t even get Energy Saver to behave correctly in Mavericks–and I just updated to 10.9.4. Energy Saver still (!) reverts to “never” and locked whenever I close it. By chance, does *anybody* know how to fix this in any version of Mavericks? I don’t know about the problem of Energy Saver reverting to “never”, but there is a workaround for the other problem where Energy Saver is set to “never” yet it still allows your computer to go to sleep even when you have important processes (like cloud sync or remote backup) running. Install a small, safe, free app called Caffeine and you’ll have one-click “always keep this computer awake no matter what” override from the top bar of the screen. Shouldn’t be necessary, but even after years of bug reports and complaints, it still is. Anybody know if AppNap has anything to do with my iMac 27-inch 2011 being glacially slow when responding to keypresses shortly after the screen awakes? Even without sleeping, it seems inevitable that whatever keys I press will get stuck and/or repeated for a short while. I agree though, AppNap is a gimmick. The real fix is for applications not to burden resources when they do not need to.